Daniel Roland Lanois CM (/lænˈwɑː/ lan-WAH; born September 19, 1951) is a Canadian record producer, guitarist, vocalist, and songwriter. Lanois has released several albums of his own work. However, he is best known for producing albums for a wide variety of artists, including Spoons, Bob Dylan, Neil Young, Peter Gabriel, Emmylou Harris, Willie Nelson, and Brandon Flowers. Lanois also collaborated with Brian Eno: most famously on producing several albums for U2, including the multi-platinum The Joshua Tree and Achtung Baby. Three albums produced or co-produced by Lanois have won the Grammy Award for Album of the Year. Four other albums received Grammy nominations. Lanois started his production career when he was 17, recording local artists including Simply Saucer with his brother Bob Lanois in a studio in the basement of their mother's home in Ancaster, Ontario. Later, Lanois started Grant Avenue Studios in an old house he purchased in Hamilton, Ontario. He worked with a number of local bands, including Martha and the Muffins (for whom his sister Jocelyne played bass), Ray Materick, Spoons, and the Canadian children's singer Raffi. Lanois attended Ancaster High School. In 1981 Lanois played on and produced the album This Is The Ice Age by Martha and the Muffins. In 1985 he earned a CASBY award for his work on a Martha and the Muffins album. Lanois worked collaboratively with Brian Eno on some of Eno's own projects, one of which was the theme song for David Lynch's film adaptation of Frank Herbert's Dune. Eno invited him to co-produce U2's album The Unforgettable Fire. Along with Eno, he went on to produce U2's The Joshua Tree, the 1987 Grammy Award for Album of the Year winner, and some of the band's other works including Achtung Baby and All That You Can't Leave Behind, both of which were nominated for the same award but did not win. Lanois once again collaborated with U2 and Brian Eno on the band's 2009 album, No Line on the Horizon. He was involved in the songwriting process as well as mixing and production. Lanois' early work with U2 led to him being hired to produce albums for other top-selling artists. He collaborated with Peter Gabriel on his album Birdy (1985), the soundtrack to Alan Parker's film of the same name, and subsequently spent most of 1985 co-producing Gabriel's album So, which was released in 1986 and became his best-selling release, earning multi-platinum sales and a Grammy nomination for Album of the Year. Lanois later co-produced Gabriel's follow-up, Us, which was released in 1992 and also went platinum. Bono recommended Lanois to Bob Dylan in the late 1980s; in 1989 Lanois produced Dylan's Oh Mercy. Eight years later, Dylan and Lanois worked together on Time Out of Mind, which won another Grammy Award for Album of the Year in 1997. In his autobiographical Chronicles, Vol. 1, Dylan describes in depth the contentious but rewarding working relationship he developed with Lanois. Wrecking Ball, his 1995 collaboration with Emmylou Harris, won a 1996 Grammy Award for Best Contemporary Folk Album. In 1998, he produced and appeared on Willie Nelson's album Teatro. Lanois was working on Neil Young's record Le Noise in June 2010 when he was hospitalized after suffering multiple injuries in a motorcycle crash in the Silver Lake area of Los Angeles. He has since recovered. Lanois' production is recognizable and notable for its 'big' and 'live' drum sound, atmospheric guitars and ambient reverb.Rolling Stone called Lanois the "most important record producer to emerge in the Eighties." As well as being a producer, Lanois is also a songwriter, musician and recording artist. He has released several solo albums and film scores; his first album, Acadie, was released in 1989. A number of Lanois' songs have been covered by other artists, including Dave Matthews, Jerry Garcia Band, Willie Nelson, Tea Party, Anna Beljin, Isabelle Boulay and Emmylou Harris, and his albums have had some success, particularly in Canada. Lanois plays the guitar, pedal steel and drums. Belladonna, an instrumental album released in 2005, was nominated for a Grammy. Lanois also provided an instrumental score for LOUDquietLOUD, a documentary about the Pixies. Lanois premiered a documentary entitled Here Is What Is at the Toronto International Film Festival in 2007. The film chronicles the recording of his album of the same name and includes footage of the actual recording. The album Here Is What Is was released, first by download, then in compact disc, in late 2007 and early 2008. Soon after, Lanois released a three-disc recording called Omni. In October 2009, Lanois started a project called Black Dub which features Lanois on guitar, Brian Blade on drums, and Daryl Johnson on bass, along with multi-instrumentalist/singer Trixie Whitley. They released a self-titled album in 2010. In 2014, Lanois played with Emmylou Harris as a sideman and opening act on a tour focused on the Wrecking Ball material he produced. On October 28. 2014 Lanois released an album titled Flesh and Machine on ANTI- Records, based on Brian Eno's ambient albums. The instrumental album consists primarily of original atmospheric and process-based sounds, blending pedal steel guitar and a variety of digital and analog sound processing devices. He was assisted by the drummer Brian Blade. In 2016, he released the album Goodbye to Language with Rocco DeLuca. Lanois released Goodbye to Language on ANTI- Records in September 2016. The album is a collaboration between him and musician Rocco DeLuca. The collaborative album Venetian Snares x Daniel Lanois was released on Venetian Snares' label Timesig in May 2018. Lanois also contributed to the soundtrack of the 2018 video game Red Dead Redemption 2, released by Rockstar Games with the song "That’s The Way It Is." Lanois won a Juno Award in 1990 as most promising artist. Lanois has received 11 Grammy Awards for his work with various artists, including Bob Dylan, U2, Emmylou Harris and Neil Young. Daniel Lanois' star on Canada's Walk of Fame. In 2005, he was inducted into Canada's Walk of Fame. In June 2013, he received a lifetime achievement award at the Governor General's Performing Arts Awards. 1993 Rocky World Documentary about Lanois' music and travels in the early 1990s. Back Where You Belong – Sinéad O'Connor, 2007. Let It Go - Mother Superior, 2007. Snake Road – Bob Lanois, 2006. No Line on the Horizon – U2, 2009 (plus songwriting credits). "Mind Games" & "Night Nurse" – Sinéad O'Connor, 2009. Mercy – Rocco DeLuca and the Burden, 2009. Flamingo – Brandon Flowers, 2010. Le Noise – Neil Young, 2010. Honest Mistake - Jim Wilson, 2012. Battle Born – The Killers, 2012 (co-writer on tracks "The Way It Was", "Heart of a Girl", and "Be Still"). Rocco Deluca - Rocco Deluca, 2014. ^ "NLS Other Writings: Say How? A Pronunciation Guide to Names of Public Figures". Library of Congress. December 17, 2008. Retrieved July 24, 2009. ^ "Lanois, Daniel". The Canadian Encyclopedia. Retrieved 2011-29-06. ^ "Grant Avenue Studios/ Daniel Lanois". Retrieved January 24, 2007. ^ Kirk LaPointe (May 11, 1985). "CASBY Awards: The people speak". Billboard. Nielsen Business Media, Inc.: 74–. ISSN 0006-2510. ^ "No Line on the Horizon". U2.com. Retrieved February 27, 2009. ^ Dylan, Bob (2004). Chronicles, Vol. 1. Simon & Schuster. pp. 176ff. ^ Sterdan, Daniel. "Lanois, Daniel: Lanois back in action after crash". Canoe Inc. Archived from the original on January 15, 2013. ^ "Electronic Musician Feature". Emusician.com. October 13, 2011. Archived from the original on September 15, 2011. Retrieved February 11, 2012. ^ "Candadaswalkoffame.com". Canadaswalkoffame.com. September 19, 1951. Archived from the original on February 4, 2012. Retrieved 2012-02-11. ^ "NYtimes.com". NYtimes.com. December 8, 2005. Retrieved February 11, 2012. ^ Lee, Nathan (September 29, 2006). "New York Times". Movies.nytimes.com. Retrieved February 11, 2012. ^ Doole, Kerry (April 15, 2014). "Emmylou Harris/Daniel Lanois – Concert Review". Exclaim Magazine. Archived from the original on April 23, 2014. Retrieved May 2, 2014. ^ "First Listen: Daniel Lanois, Flesh and Machine". NPR. October 19, 2014. Retrieved November 28, 2014. ^ "Albums from Jerry Lee Lewis and Daniel Lanois". New York Times. October 27, 2014. Retrieved November 28, 2014. ^ Moon, Tom (September 1, 2016). "Review: Daniel Lanois, 'Goodbye To Language'". NPR.org. Retrieved September 19, 2016. ^ Kupper, Oliver Maxwell; Bowie, Summer (January 28, 2016). "Transcending the Blues: An Interview With Legendary Record Producer Daniel Lanois". Autre Magazine. Retrieved September 19, 2016. ^ "Canadaswalkoffame.com". Canadaswalkoffame.com. September 19, 1951. Archived from the original on February 4, 2012. Retrieved 2012-02-11. ^ "NFB shorts: Stories Sarah Tells, Canadian Famous and Daniel Lanois". Toronto Star. June 10, 2013. Retrieved June 13, 2013. 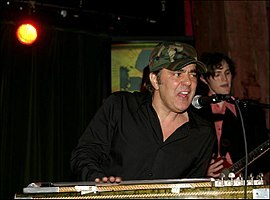 Wikimedia Commons has media related to Daniel Lanois.